Having opened on the 16th November 2014, the Four Seasons Resort Dubai at Jumeirah Beach captures the city’s energy and excitement in a glamorous new beach resort. 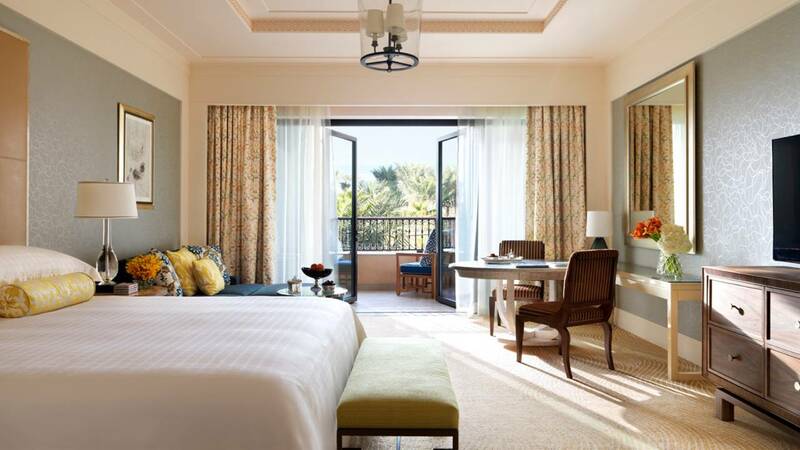 Set on a pristine, natural beach, Four Seasons Resort Dubai at Jumeirah Beach blends Arabic design with cool, contemporary style – creating an atmosphere of light, sophisticated luxury. 237 ultra-spacious Dubai hotel accommodations – including 49 suites – offer views of Burj Khalifa and the downtown skyline on one side and the Arabian Gulf and the downtown skyline on the other. Located on the third to fifth floors of the Resort, Premier Sea View Rooms offer 70 square metres (753 square feet) of indoor and outdoor space. Take in stunning views of Jumeirah Beach and the Arabian Gulf from your own private balcony. Located on the higher floors of the Resort, Premier Skyline Rooms offer 70 square metres (753 square feet) of indoor and outdoor space. Take in stunning views of the Dubai skyline, including the Burj Khalifa, from your own private balcony. Located on the first and second floors of the Resort, Deluxe Sea View Rooms offer 70 square metres (753 square feet) of indoor and outdoor space. Step out onto a private balcony showcasing partial views of the calm blue waters of the Arabian Gulf. Located on the first to third floors of the Resort, Deluxe Rooms offer 70 square metres (753 square feet) of indoor and outdoor space. Experience the captivating energy and excitement of Dubai with views of the city from a private balcony. Relax in an atmosphere of light, airy luxury. Subtle Arabic design motifs blend with cool, contemporary style in seaside colour palettes of blues and greens. A separate living area is equipped with a sofabed, 55-inch flat-screen high-definition television and wireless technology, while the private terrace has a day bed and dining table for two. 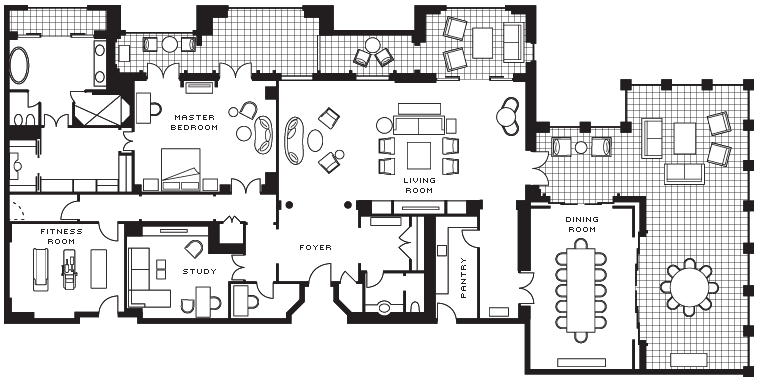 Spacious and sophisticated, Four Seasons Skyline Suites feature a separate living area. A private balcony showcases views of the city and Jumeirah residential area from all floors of the Resort. Spacious and sophisticated, Four Seasons Sea View Suites feature a separate living area. A private balcony showcases partial views of the Arabian Gulf and beach. 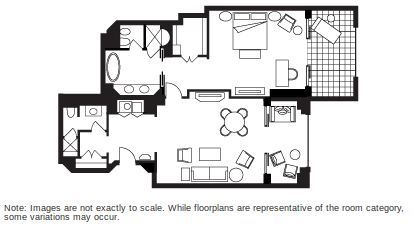 Suites feature up to 173 square metres (1,862 square feet) of space, including a separate living area. A private balcony showcases views of the impressive skyline of Dubai. A private balcony showcases views of the Arabian Gulf Sea area. From its privileged location on the first through fourth floors of the Resort, the Imperial Suite showcases uninterrupted views of the ocean and beach. Two expansive terraces offer additional space for dining or lounging. Elegant and stylish spaces invite social ease with a separate living room, a dining room with seating for eight, a pantry, guest powder room and a study. 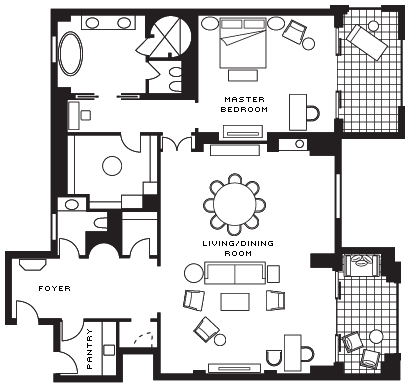 This suite can be easily configured as a two-bedroom suite with the addition of a second room. Elegantly designed, the master bathroom features a white marble floor, silver leaf ceiling, marble tile wall and a custom Murano glass pendant. Facilities include deep soaking tub, a mirror with built-in television and a separate rain shower. Welcome in ocean vistas from the 510 square-metre (5,490 square-foot) Presidential Suite, located on the Resort’s fifth floor. Boasting a separate living and dining room, media room, study and gym, this suite offers ample space for leisure and business pursuits. A welcoming space for social gatherings, this suite is party ready with a pantry, ample seating and a guest powder room. Dine or lounge on a private terrace and enjoy sweeping views of the Arabian Gulf Sea. This suite can be easily configured as a two or three bedroom suite with the addition of connecting rooms. For ultimate in luxury, the Presidential Suite is best experienced as a three bedroom suite. The gloriously appointed Royal Suite offers lavish surroundings for high-level executives or VIP guests. Enjoy the privacy and convenience of a dedicated spa, fitness and steam room, located in your suite. A welcoming space for social gatherings, this suite is party ready with a full kitchen, baby grand piano, media room and guest powder room. Take in stunning views of the Arabian Gulf Sea and relax on one of two terraces furnished with sun loungers, day beds and chairs and dining for six. Grand design takes centre stage in this suite with towering columns, soaring ceilings and Venetian chandeliers. Large hand-tufted wool and silk rugs provide a warming touch to marble floors. 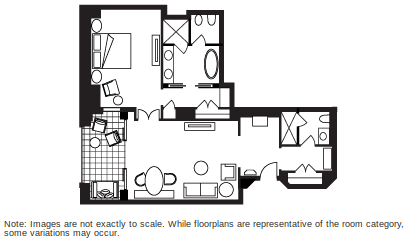 This suite can be easily configured as a larger suite with the addition of connecting rooms. For ultimate grandeur, the Royal Suite is best experienced as a four-bedroom suite. A hot new beachfront fine dining destination, Four Seasons is home to ten of the best Dubai restaurants and lounges. Within Four Seasons Resort Dubai at Jumeirah Beach, discover five distinctive venues, each offering acclaimed cuisine and attentive Four Seasons service. Just opposite the Resort’s main entrance, five independent venues are located in a uniquely curved free-standing building, including four specialty restaurants and a rooftop nightclub. 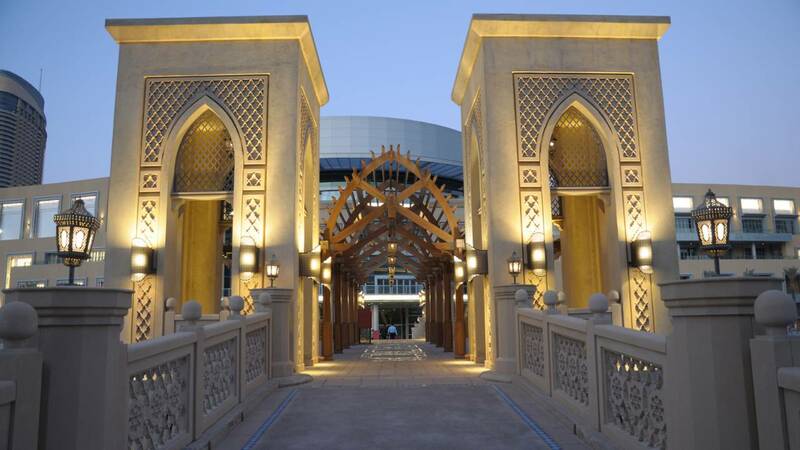 Meaning “market” in Arabic, Suq features eclectic international cuisine. This lively market-style Dubai restaurant includes three open kitchens, a private dining room and an outdoor terrace with views of the gardens, pools and sea. On Jumeirah Beach, discover one of the best seafood restaurants in Dubai. Sea Fu serves cutting-edge Mediterranean-style dishes and Asian-influenced delicacies by the pool and beach. With a name meaning “tea” in Arabic, Shai serves tea, coffee and lighter fare. Close to the main entrance, this Dubai restaurant is a perfect meeting place for business and social occasions – indoors or on the sea-view terrace. Among the best bars in Dubai, this sea-view venue on lobby level is like a lushly appointed gentlemen’s club, featuring club chairs and oak walls with leather panels. Meet for cigars and cocktails. The jewel of Four Seasons, this chic rooftop bar in Dubai is located on the sixth floor, overlooking Burj Khalifa and the Dubai skyline on one side, and Burj Al Arab and the sea on the other. An exclusive destination for socialising. Retreat to the quiet adults-only pool set amidst towering palm trees and lush landscaping, within steps of Jumeirah Beach. Sparkling with white and gold mosaic tile, the pool is surrounded by day villas, which offer a private sun terrace, indoor and outdoor showers, private bathroom, mini bar, flat-screen TV and air conditioning. Guests of all ages are welcome at this free-form outdoor pool, separated by gardens from the quiet adult pool. For the ultimate in luxury and convenience, cabanas offer a fan, sun loungers and a terrace. Located next to the spa, the climate-controlled indoor pool invites guests aged 16 and older to partake in a lap swim beneath its glass dome. Relax tired muscles with a post-workout soak in the whirlpool. The 24-hour fitness facility features floor-to-ceiling windows that overlook the pool and gardens and invite in the natural energy of the sun. Our comprehensive, state-of-the-art facilities include cardiovascular equipment, free weights, sauna, whirlpool and locker room. Private spinning and personal training studios enhance the experience. A 5-star Dubai beach hotel, Four Seasons offers 270 metres (886 feet) of pristine sand on Jumeirah Beach, featuring lounge chairs, umbrellas and a full array of beach services and refreshments. Enjoy non-motorised water sports, such as kayaks, stand-up paddleboards and paddle boats. In a city where lavish spas are the standard, The Spa at Four Seasons Resort Dubai at Jumeirah Beach creates a must-experience showpiece. This 706-square-metre (7,600-square-foot) Dubai day spa features 10 spacious treatment rooms, deluxe aqua thermal experiences, gorgeous gardens, and an indoor swimming pool topped by a glass canopy. Inspired by the fusion of desert and sea, the ancient and futuristic, this Jumeirah hotel spa melds a myriad of cultural influences with luxurious Four Seasons standards and services. Traditional healing rituals combine with the newest technologies, creating the best Dubai spa experience. For hairstyling, discover the men’s grooming lounge and the EN VOGUE Coiffure women’s beauty salon, including Dubai nail spa services. For Dubai massage and facials, Four Seasons offers 10 spacious treatment rooms, including the ultra-lavish Royal Spa Suite – all with foot ritual baths and several with steam showers. Each day-lit treatment room opens to a small garden and relaxation alcove. The men’s and women’s changing rooms each include a custom-designed deluxe aqua thermal experience, unparalleled in any Dubai spa. Design your own journey of relaxation, enjoying the steam room, whirlpool, chill experience, rain tunnels and scrub bar. Step into EN VOGUE Coiffure for sophisticated hairstyling. Enjoy the relaxed atmosphere and select products such as L’Oréal, Kerastasse and En Vogue’s own “Ever”.